The 2017 Clinton Sheerr Award for Excellence in New Hampshire Architecture was bestowed on Carolyn Isaak, Honorary AIANH. The Award honors and promotes New Hampshire architects, their commitment to the community, and design that exemplifies excellence at the highest level. The award may also recognize non-architects who have also received Honorary Membership in AIANH and who, through their efforts, promoted excellence in architecture in New Hampshire. The award is named after Clinton Sheerr AIA, a well-known New Hampshire architect who died in 1997. Sheerr exemplified great passion for beauty and design, a dedication to the community, and the tenacity to follow one's tasks and dreams. The award honors other similarly outstanding individuals in New Hampshire who carry on this tradition of deep love and dedication for the State, its architecture and environment. At the annual AIANH Awards Ceremony on January 20, 2017 at the Manchester Country Club, Carolyn was presented this prestigious award by Patricia Sherman FAIA, herself a past recipient of the Sheerr Award. In her comments, Sherman stated, "Carolyn has architecture in her DNA. She is the daughter of an architect, the niece of an architect and the aunt of an architect. With such genetic history Carolyn was more than just the Executive Director of AIANH for 17 years. She understood and loved the profession and mentored a fledging NH chapter of AIA to become a star in the AIA galaxy of chapters. "Through bear and bull design markets Carolyn kept AIANH solvent and a friend to its members. She produced the NH Forum monthly newsletter and kept us all up to date on state and national issues. 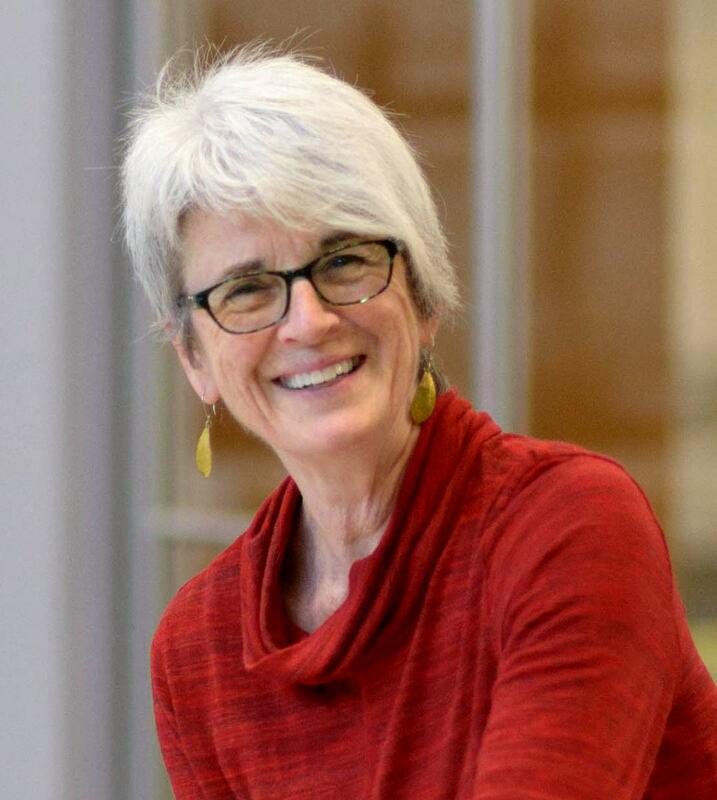 She fostered the NH Architecture Foundation, its scholarship programs and its support of the wonderful educational outreach programs, Learning By Design, that AIANH conducts in the schools. "In 2007 AIANH received a $10,000 Challenge Grant from AIA National to create a demonstration project in their home state. Our ambitious two-year project, The Redevelopment of Mill Plaza in Durham, required significantly more money than the grant provided so Carolyn not only raised some of the additional money needed for the project but spent many hours coordinating the efforts of the many volunteers who made this it such a success, receiving a commendation from AIA National and an award from the NH Planners Association. "In 2013 AIANH created the NH Architects and Engineers Emergency Response Task Force (NH AEER TF) to serve as second responders in disasters. To protect these volunteers from liability NH needed to add architects and engineers to the Good Samaritan Law, which had to go through the challenging legislative process before becoming law in 2015. Carolyn, working behind the scenes, shepherded this law through the approval maze using her political skills, charm and thorough knowledge of the Architectural and Building professions to persuade and educate legislators of the value of such a law." Knowing the importance of sustainable and carbon neutral planning and design in preserving the health of our state and our planet, Carolyn worked with the Environmental Guild to produce six Integrated Design/Integrated Development conferences, which drew leading presenters from around the country and participants from throughout New England. In 2014 she led an effort to bring Architecture 2030’s AIA + 2030 Professional Series to New Hampshire. Building on that momentum, she guided the AIANH Board and the Guild in developing New Hampshire’s own 2030 & Beyond Series, providing tools for our members to design and build to meet the 2030 Challenge. Carolyn retired from the position of Executive Director in October 2016. She continues to be involved with AIA as the Executive Director of AIA New England. The 2016 Clinton Sheerr Award for Excellence in New Hampshire Architecture was bestowed on Frederick W. Urtz AIA. The Clinton Sheerr Award honors and promotes New Hampshire architects whose architecture demonstrates excellence in design at the highest level. The award is named after Clinton Sheerr AIA, a well-known New Hampshire architect who died in 1997. Sheerr exemplified great passion for beauty and design, a dedication to the community, and the tenacity to follow one's tasks and dreams. The award honors other similarly outstanding architects in New Hampshire who carry on this tradition of deep love and dedication for the State, its architecture and environment. Fred Urtz has a talent for connecting with people on a very personal level. Whether a fellow professional, client, contractor, co-worker or community volunteer; anyone who comes in contact with Fred can’t help but to be drawn to him by his sincerity and enthusiasm. A sincerity and enthusiasm not only for design, but for the community at large. Urtz’s positive impact on New Hampshire’s built environment is nearly immeasurable. For more than 35 years he has led the design of notable projects from corner to corner of the State and beyond. His work is distinguished by his unique creativity, commitment to innovation, and passion for improving the lives of others. In 1982, Urtz joined Lavallee Brensinger Architects in Manchester and soon took on the position of president, dedicating himself to the firm’s Education Design Group. A thought leader, Urtz has led the way for school designs that promote collaborative learning and support both traditional and emerging educational models. He also advocates for schools as multi-purposed community resources; sources of civic pride that serve the broader population. Urtz has personally led the programming and design of dozens of educational and civic projects, many of which have been recognized regionally and nationally for their programming and design excellence (including 11 AIA New Hampshire Design Awards). He pushes himself and his co-workers to be creative and to design classrooms, gymnasiums, theaters, dormitories, lecture halls that are stimulating to the students and supportive of educators. Harry Vogt, who presented the award, said, "It was recently shared with me that more than 20,000 of New Hampshire’s students are impacted on a daily basis by Fred’s designs. What an incredible number and what an incredible responsibility." Fred is also recognized for his mentoring of the many young interns and architects who have worked for him directly; his patience, sense of humor, passion, and dedication to the profession have been thoroughly instilled in numerous professionals in the architectural community. Many in the wider community also know Urtz for his volunteer efforts. He has spent countless hours serving on various boards and in leadership roles with organizations that support many of New Hampshire’s young people, including CASA and Easter Seals. His longstanding commitment to these organizations on a local level eventually led to his tenure on Easter Seals’ National Board of Directors, a position he held for several years. The 2014 Clinton Sheerr Award for Excellence in New Hampshire Architecture was bestowed posthumously on Duffy Monahon and Rick Monahon AIA. In addition to awarding the Clinton Sheerr Award to the Monahons, AIANH has instituted a new award, the Rick and Duffy Monahon Award for Excellence in Architectural Preservation, which will begin with the 2015 Design Awards program. Rick and Duffy Monahon were two extraordinary people who gave generously throughout their careers in the areas of architecture, preservation, and planning. Rick began his architectural practice in Peterborough, NH, in the early ’70s, with the rehabilitation of the historic Harrisville mills (a project that he continued to work on until his death). After meeting Duffy, and their subsequent marriage, they worked together at their firm, Richard M. Monahon, Jr. AIA Architects, housed in the Granite Block in Peterborough. They were both passionate about history and finding new uses for old buildings and so it made sense that they would become intensely involved in planning and historic preservation. In their hometown of Peterborough Rick helped grow the Peterborough Players facility from a simple barn into a true summer theater complex. They both took great pride in Duffy’s renovation of the historic Dublin Lake Club and her discoveries and subsequent restoration of the concealed jewels of the Wilton Town Library. Rick twice served as a director on the AIANH Board of Directors and was a founding member of the NH Preservation Alliance. He also served on the board of Plan NH and undertook numerous pro-bono design charrettes and consultations, just to lend a hand and help a good project move forward. He was a member of the Peterborough Planning Board and the NH State Board of Architects, of which he had taken chairmanship shortly before his death. Duffy was driven in her quest to preserve our most loved buildings and landmarks and was always out-there, a fearless leader. Many would eventually come to realize how right she was about guided community conservation in both man-made and natural environments. She was involved with the Peterborough Conservation Commission and the Heritage Commission and can be credited with preserving several historic buildings in Peterborough. The two of them also continued to push back the encroaching vegetation of time on their land to when it was farmed and did much to frame the issues of community farming. The Executive Director of the New Hampshire Preservation Alliance, Jennifer Goodman, said, the Monahons “seemed to collect new ideas and new friends wherever they went, and inspired their peers, clients, and a new generation of architects and preservationists.” They were visionaries and a source of energy. The Monahons won numerous awards over the years from AIANH: Newbury Center Meeting House; Dublin Lake Club; Gregg Free Library, Wilton; a private home in New Mexico; Stefansson Nef Photographic Studio, Peterborough; Crotched Mountain Rehabilitation Center Student Apartments, Greenfield; Shops at Granite Hill; Hooksett; Parish Hall of the All Saints Episcopal Church, Peterborough; Peterborough Savings Bank addition; and the Main House Renovation and Addition at the Dublin School. The Town Hall, Temple; Searles Library, Windham; and the Brown Block, Keene, all received awards from the New Hampshire Preservation Alliance. Barry Brensinger AIA is the winner of the 2013 Clinton Sheerr Award, New Hampshire's premier award honoring architects and architecture that exemply excellence in design at the highest level. Barry is a well-known architect in New Hampshire whose firm, Lavallee Brensinger Architects, has long been recognized as one of the leading design firms in the State and in northern New England. Brensinger joined the company in 1978 and became a partner in 1980, when he made a personal commitment to make it a top design firm. Over his 32 years of his leadership, he has accomplished that and much more. Brensinger’s passion for design and his commitment to design excellence have been recognized by the 23 AIANH design awards Lavallee Brensinger has received over the past 29 years. Major designs include the Verizon Center, Manchester City Hall Plaza, the Manchester Airport Terminal, Christa McAuliffe Planetarium, St. Joseph Hospital in Nashua, and the new Manchester Department of Public Works Administrative Building. In the late 1980s Brensinger led his firm to a decision to add healthcare design as a core practice area. Assuming primary leadership of this effort, Barry built a strong professional team and encouraged research into best practices and evidence-based design. Under his leadership the firm’s Healthcare Design Group has become one of the most experienced healthcare planning and design teams in the region, and currently has healthcare projects in all seven Northeast states. Throughout his career, Barry has maintained an unwavering commitment to community service. He has served as chair of the New Hampshire Charitable Foundation and the Manchester Regional Community Foundation. He has been named the Chamber of Commerce Citizen of the Year as well as its Business Person of the Year. He has also chaired the Chamber itself. Active in community affairs, he was the vice chair of Catholic Medical Center, chair of NH Business Committee for the Arts, and trustee for Neighborworks Manchester. He has been a member of UNH Manchester, NH Community Technical College Manchester, and NH Technical Institute Advisory Boards, Salvation Army Advisory Board, Chair of Greater Manchester Chamber of Commerce, Director of Child Health Services, and Vice President of the Manchester Boys and Girls Club. Jim Somes FAIA is a well-known architect in New Hampshire, New England, and national architectural circles, having practiced in the state for over 25 years. In 1980 he founded his own firm, JSA Inc., in Portsmouth and grew it to be of the largest in the state, then expanded it to other branches along the east coast. During that time he designed more than 20 award-winning projects, recruited and mentored a host of talented young professionals, and provided vision and leadership to the design and construction industry. Among his designs are Pinewood Manor, Old Orchard Beach, ME (1981); Hewitt Hall Renovation, UNH (1995); and Exeter Hospital (2000). Somes was president of AIANH in 1989-90, and a long term Board member. He was also one of the founders of Plan NH, an organization that thrives today as a proud offspring of AIANH serving the state’s communities. He served as a board member of Strawbery Banke, was a Boston Architectural College instructor, Portland School of Art Curriculum Advisor, and a Board Member of the Portsmouth Music Hall, among many other volunteer activities. AIA conferred Fellowship status on Jim in 1995. This list of achievements is just a sample of Jim’s service to his profession and his community. But nowhere on this list do you get the full dimension of his most appreciated contributions to the profession and practice of architecture here in New Hampshire. Jim saw the profession of architecture as a way to bring generosity and collaboration into the competitive business of architecture. Success was the common denominator in all of Jim’s efforts, but not for himself. He treated his clients as partners in successful projects. He treated his peers as friends even though they were competing for the same job. If you were a young person interested in architecture he found you a job, usually in his own office. He mentored his employees and encouraged them to start their own businesses. Many architects in New Hampshire owe their success to their interaction with Jim. He gave also gave huge amounts of time and energy to community efforts and knew the true meaning of pro bono work. Somes set the bar high for everyone in the profession and then helped us all to succeed. Patricia has a true passion for the profession of architecture as well as a passion for ethical practice. She also has big picture vision and a strong history of sharing her vision to the benefit of the profession at large and for the people of New Hampshire. At the same time she has always been grounded in thoughtful action. Pat has used her position as an architect to make significant contributions to the profession at both state and national levels. At the same time she had a career of promoting excellent design. After working to establish an architectural practice within the successful Landscape Architecture firm of Matarazzo Design, in 1990 Pat became a founding principal of Sherman, Griener & Halle LTD centered in Concord, NH. The firm later morphed into Warren Street Architects. As a practitioner Pat involved in numerous distinguished projects, which were recognized with AIA NH awards including Honor Awards for the Androscoggin Visitor's Center for the Forest Service in Gorham, NH and the NH Fire Training Academy Fire House in Concord, NH. She was part of the team that developed the Straw Hill Condominium Project in Manchester, which received the Urban Land Institute's Best Community Development Award and was further recognized by AIA National in an exhibit of women architects. Pat is New Hampshire's first registered female architect. She has played a pivotal role in many of the state's architectural and planning initiatives that have helped enlighten the populous and enrich the environment. Her work with AIANH included efforts at promoting the significance of the profession to the public though educational, publication and advocacy efforts. A Founding Director of PlanNH, she is a strong advocate of the charrette process, which led to her leadership role in the AIA 150 Initiative with the AIANH planning efforts in Durham. She continues to volunteer her services even in retirement. Pat was an AIA New England Regional Director and served on AIA National committees and task forces as well as being the Vice Chair of the AIA Trust. She also served and chaired the New Hampshire Board of Architects and served the National Council of Architectural Registration Boards on their Professional Practice Committee.She was elected to the AIA College of Fellows in 1999. While her influence has been felt nationally and throughout New Hampshire, Sherman has also been very willing to volunteer her time and expertise locally, both in Concord where her office was and in Newbury where she lives. "Pat's commitment to the legacy of architecture is an inspiration," noted Jonathan Halle AIA, her business partner prior to her retirement. The 2010 winner of the Clinton Sheerr Award for Excellence in New Hampshire Architecture is John W. Merkle AIA, of TMS Architects in Portsmouth, NH. As an architect with a solidly rooted interest in preservation, John has been key to saving numerous historical structures and has given major amounts of time to the support of preservation and other architectural efforts throughout the state of New Hampshire. In 1984 John co-founded TMS Architects and in the years since has carved out a niche in the field of historical preservation, committing himself and his firm to saving and restoring some of New England’s most significant historical landmarks. His work has included the restoration of The Wentworth By The Sea Hotel, New Castle, NH; The Music Hall and the Portsmouth Discovery Center in Portsmouth; the American Independence Museum, Exeter, NH; and the Bridges House, the New Hampshire Governor’s residence in Concord, to name a few. John’s history of volunteerism is legendary. Always enthusiastic and willing to help, he has assisted restoration projects and various preservation groups from all over the state and the region and has made additional significant contributions to the field by his participation in numerous non-profit organizations. He has served on the board of directors and as president of AIA New Hampshire, AIA New England, and the New Hampshire Preservation Alliance. He was chair of Exeter’s Historic Commission, and is currently on the Board of Directors for the Castle Preservation Society, as well as an IDP Sponsor of NCARB. Over the years John has also mentored many young professionals and has been generous in his time with students. At TMS he has empowered his employees, helping to create dynamics in which younger architects and interns are encouraged to flourish and learn. Deeply concerned that his passion for historic preservation not end, John is working closely with members of his firm to imbue a sense of the value of our New England heritage that he has worked to protect for so long. The 2009 winner of the Clinton Sheerr Award for Excellence in New Hampshire Architecture is Daniel V. Scully AIA of Keene, NH. The Clinton Sheerr Award objectives are clearly personified in Dan, an architect who has consistently endeavored to produce high quality work that is environmentally responsive, and an architect who has given greatly to the community at large. Dan has been practicing architecture in New Hampshire since the early seventies. He was vice president of TEA (Total Environmental Action) in Harrisville and was designing innovative green buildings long before the LEED (Leadership in Energy and Environmental Design) program came into existence. Since 1983, Dan has run his own small office, which remains a full service firm of professionals dedicated to providing the highest quality of design that directly resolves functional requirements while incorporating strong and sustainable designs appropriate to the specific project, program, site, and budget. He guides his firm to resolve project design issues in their largest social and site contexts, while also directly resolving functional issues in a modern, energy-efficient manner, within the context of the budget. One of Dan’s projects from 1986 was a Masterplan for the campus at the College of the Atlantic in Maine. From the Masterplan work, a new building, Kaelber Hall was designed and built, which became the gateway and symbol of the campus. His design for this building employed innovative daylighting strategies and heat recovery systems that are still advanced and revered by today’s standards. Dan has won AIANH Design Awards for several design projects: the Porter Residence, the Draper Residence, the Wollaeger Residence, the Hancock Screen Porch, and the Bellows Falls Waypoint Interpretive Center in Vermont. The Bellow’s Falls building brought back historical associations and meanings so important to Bellows Falls’ identity, and was also ironically the first contemporary building awarded a design award from the Preservation Trust of Vermont. Dan has also won four PlanNH awards for community and architectural planning between 2000 to 2005 for projects such as Peterborough’s Depot Square, 46 Main Street in Keene, and the Millwork Masters Window Showroom also in Keene. In addition to his built contributions to New Hampshire communities, Dan has remained involved with Keene’s Friends of Center City, The Keene Rotary, Keene State College’s Architecture program, and numerous other local boards and organizations. Many of his projects have been featured in newspapers, magazines, and books, and he has lectured and served as a juror for other design award programs. The 2008 winner of the Clinton Sheerr Award for Excellence in Architecture is C. Stuart White Jr., AIA of Lebanon, NH. The jury selected Stu for his early recognition of the environmental challenges in the building industry, his commitment to and leadership in sustainable design, and for being a positive role model for architects. Five years after receiving his degree in architecture from Columbia University, Stu joined Banwell Architects in Lebanon, NH, and he and his wife embarked on a life-long energy conservation commitment. This was in the late sixties, even before the oil embargo of the 1970s. Back then Stu predicted that things would not change until oil hit $100.00 a barrel — on January 3, 2008 it did just that! Not a welcome milestone. But he is delighted that people are finally waking up. In the '70s people looked him oddly when he talked about his sustainable design ideas, but he remained dedicated and held on to his ideals. For four decades now, he has practiced his craft and wielded his influence in the Granite State. Stu's devotion to sustainable design is evident in all his buildings, as well as his personal commitments. One of his many projects is the Society for the Protection of NH Forests Conservation Center in Concord, which received a LEED!" Gold designation from the U.S. Green Building Council — the first LEED certified building in New England, and at the time, in 2001, one of only 12 Gold projects in the country. In this building, the design emphasis includes an air-tight envelope, water conservation, air quality, daylighting, native certified green forest products, recycled projects, construction waste recycling, and district heating from central wood chip plant. Stu also designed one of the first residential projects to be accepted into the pilot LEED!" for Homes program, a home in Dorchester, NH. This project meets the highest standards of environmental stewardship and promotes environmental education and research. It includes renewable energy, including solar and hydro, and the entire structure and finishes of the barn/house are harvested from Green Woodlands sustainably managed forest, demonstrating the viability and variety of regional species as a preferable alternative to forest products imported from outside northern New England. Stu was Chairman of AIANH's Task Force on Sustainable Architecture from 1993 to 1995 and has been a member of the Society for the Protection of NH Forests' Green Certification Advisory Group since 1998. He has served on AIANH's Board of Directors and the Advisory Council of the NH Technical Institute. He was an Adjunct Assistant Professor in the environmental studies program at Dartmouth College, and was an energy consultant to the Brookhaven National Labs from 1980 to 1984, focusing on passive solar energy utilization. He currently serves on the Board for the Jordan Institute. Stu has lectured widely on architecture and the environment. His wide-ranging projects have received numerous AIA and industry awards for design excellence, and been published in magazines internationally. As the 2007 recipient, Chris Williams exemplifies and carries on the tradition of deep love and dedication for the State and its architecture exemplified by Clinton Sheerr. Chris Williams has garnered numerous awards for his designs, including many AIANH Excellence in Architecture awards, and his work has been featured in several books, newspapers, and magazines. He has been selected to serve on many awards program juries throughout New England. Chris has donated his time and his creative spirit to his community, his profession, and the non-profit world of New Hampshire and beyond. He currently sits on the National Council of Architectural Registration Boards (NCARB) and the NH Board of Architects. He is active with AIA New Hampshire and served on its board for many years and as president in 1999. Chris has also been active with the NH Preservation Alliance, NH Main Street, the Meredith Chamber of Commerce, and the Moultonboro Area Community Development Corporation, among others. Over the years he has given countless hours to nearly 20 design charrettes. Jeff Taylor was the first recipient of the Clinton Sheerr award. His award was given for leadership and commitment, to preserving/protecting the quality of life in New Hamphshire through the built environment. Jeff began his planning career with the City of Berlin, New Hampshire, in 1977. There he was responsible for zoning and subdivision issues, grant writing, and project administration. He later became director of all community and economic development for the city. He attracted in excess of $10,000,000 in public grant funds to this community of 12,000 people. In 1989 Jeff was asked by then Governor Judd Gregg to become the Director of the New Hampshire Office of State Planning. Mr. Taylor was asked to stay on in that capacity under Governors Steven Merrill and Jeanne Shaheen. During these terms Mr. Taylor led major initiatives in environmental legislation, in economic development, and in community planning. In January of 2003, he formed Jeffrey H. Taylor and Associates to provide consulting services in the areas of community planning and economic development to northern New England communities. His current client list includes the Cities of Dover and Berlin, New Hampshire; the Newfound Lake Region Association, and the NH Departments of Environmental Services and Transportation. Jeff is the winner of numerous awards for his work in community planning, including, in 2003, being named an honorary member of the New Hampshire chapter of the American Institute of Architects and receiving an award for outstanding leadership from the New Hampshire Preservation Alliance. Belmont Mill above right is the result of one of the Jeff Taylor-led PlanNH Design Charrettes. Photo at left shows Jeff giving one of his many presentations.